Emails are not the enemy of productivity - with ActiveCollab, you can turn your email inbox into a valuable ally. ActiveCollab email notifications enable you to always stay up to date and know what's going on across all your projects - but that's not the full extent of this feature. 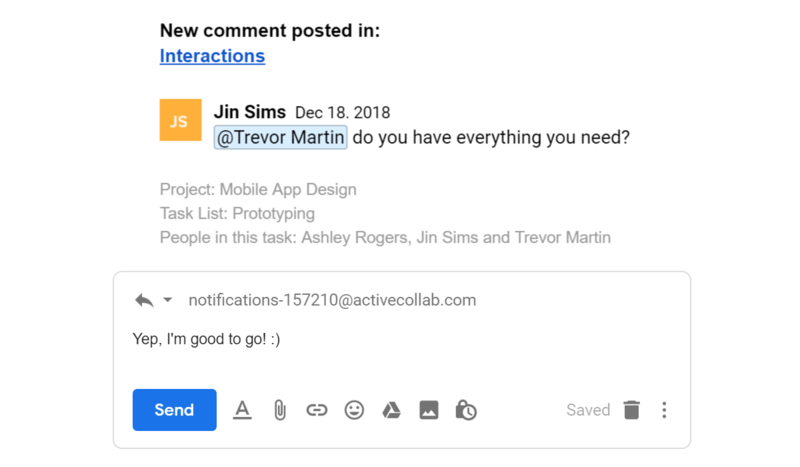 ActiveCollab integrates with your inbox in a way that you're able to create tasks from email or comment on existing tasks simply by replying to an email notification. This is perfect for situations where you want to give a quick response to a discussion without opening the app in a new tab, or if you're viewing your updates on the go. Create a custom email address for your ActiveCollab projects and you'll be able to create tasks by sending an email to that specific address. You can even use the auto-generated address from the project info, but those are more difficult to remember. This option is available to your clients as well - they can create discussions directly from their inbox, or even tasks if they have the Client+ role. Emails should not be the enemy of Real Work, it's all about making them your ally - not a distraction.